We probably should have a FAQ for this as it keeps coming up. Here are some starting points .. The first two BIOS versions have a bug that prevent the machine from recognizing more than 544KB. The first two versions also do not scan the ROM BIOS areas for ROM BIOS extensions, so they can not be boot from a hard disk, use an EGA or VGA card, or make use of any device that is dependent upon a ROM BIOS extension. The third version of the BIOS adds support for adaptors have that ROM BIOS extensions. Without this support, these machines can't boot from a hard disk, use an EGA or VGA card, or boot over a network. This BIOS was offered as an upgrade to owners of older machines. All BIOS versions are 40KB in size. Chip U33 has the 8KB of BIOS. Chips U29-U32 (8KB each) hold BASIC. Revision one (PC1) machines have a minimum of 16KB on the motherboard, which is expandable to 64KB. Revision two (PC2) machines have a minimum of 64KB on the motherboard, which is expandable to 256KB. All PC 5150 motherboards have two sets of DIP switches for memory and device configuration. Larger power supply: 130 watts? The first revision BIOS (11/08/82) has all of the features of the 10/27/82 IBM PC 5150 BIOS. This version was used on the 64/256K motherboards. 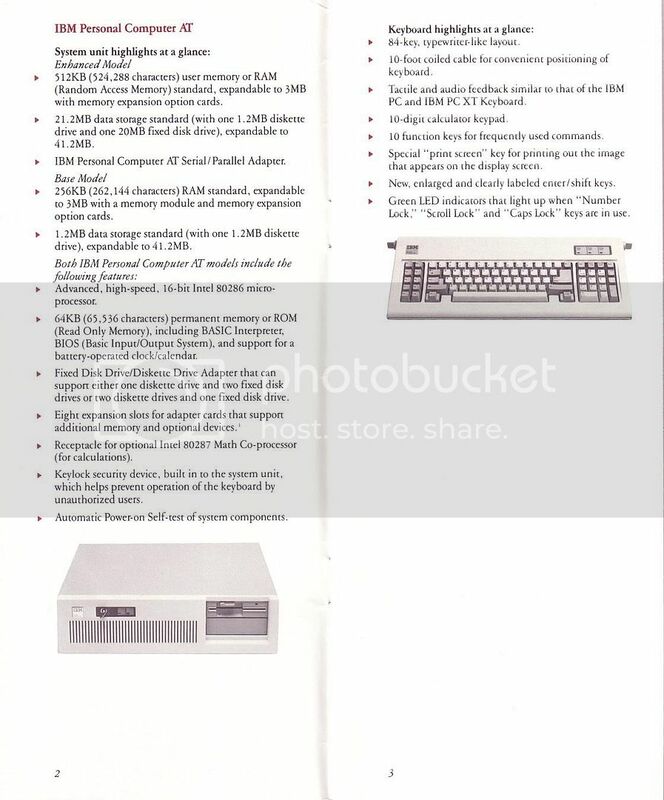 The second revision BIOS (01/10/86) added support for the new IBM Extended keyboard and 80 track floppy drives. High density floppies might also be supported by the BIOS, but it is unknown if it works because the hardware that IBM shipped did not have a high density data rate. Last edited by mbbrutman; January 21st, 2008 at 07:59 AM. I have two photos of the mainboards from 5150 and 5160 if the original poster wants to include them. Last edited by dongfeng; July 27th, 2006 at 11:02 AM. The only monitor available from IBM for the 5150 when it was introduced was the 5151 (green monochrome) monitor! This was the case for about 20 months! There was no IBM CGA (5153) monitor until 1983. My April 1983 issue of PC World has an announcement that IBM is introducing a color monitor for the IBM PC. 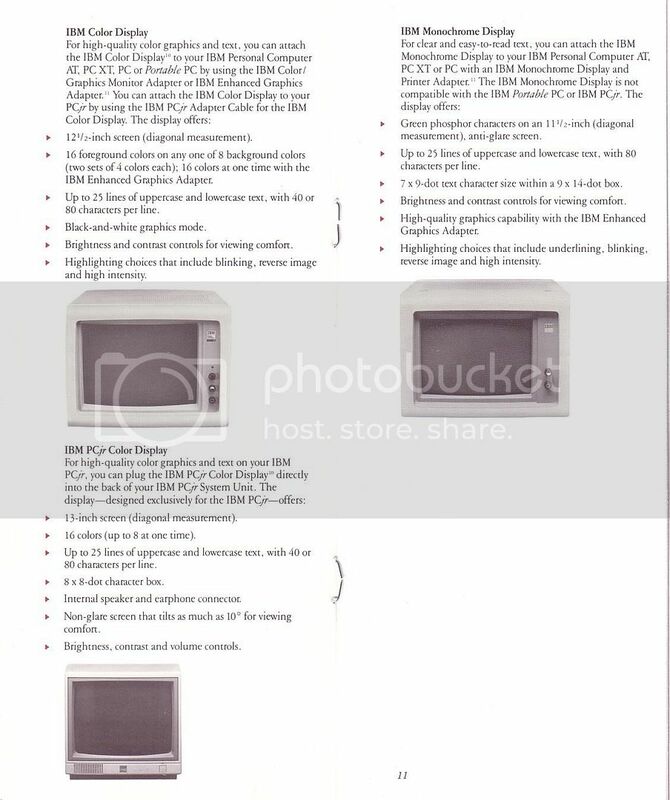 It says an IBM spokesman promised the new monitor would be available in April of 1983 and its product number was 5153. My March 1983 PC World magazine has an ad for the IBM system, the monochrome monitor is the only option. In the April 1983 issue, it now says "color or monochrome" as display options. Understand the distinction, the CGA video card was availble when the PC was introduced in 1981. But there was no IBM color monitor to go with it. If you wanted a computer color monitor at that time, you had to go with an expensive third party RGB monitor. 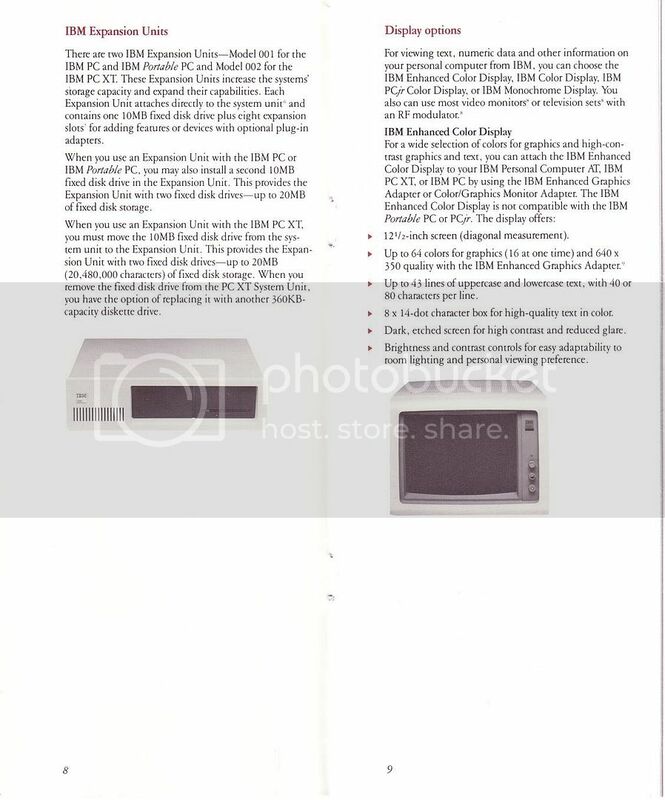 I know I read an article on a review of the original 5150 from 1981, it stated that "IBM has no plans to offer a color monitor for the 5150". Secondly, the black finished power supplies in the 1981-82 made 5150's had unusually quiet fans! When I got my first 5150 back in the late 1990's, it was one of the 16-64k models with the two screw holes holding the top cover. When I turned it on, there was no fan noise audible for at least five seconds and even after ten seconds it could literally barely be heard. The power supply fan started up so slowly and was so quiet, I thought the computer had a defect, but there was nothing wrong. I did read an article on on the 5160 when it was new, and the reviewer was complaining that the power supply fan in the 5160 was much louder than the one in his 5150, and made interference on his TV! I think the "newer" chrome power supplies in the 5150's from 1983 and later had fans that were about as loud as the ones in the 5160's. "IBM says it has no interest in manufacturing color monitors, letter-quality printers, joysticks, or light pens, nor can IBM supply you with the cables that will have to be made to connect these devices to the IBM micro-computer." "Here are some speculations about future IBM Personal Computer products. An official RG8 color monitor. I don't think IBM is going to go for this one, but it should. I have seen three separate IBM Personal Computers with RGB monitors. In all three cases, the monitor used did not have an input for the intensity signal and so could display only eight of the sixteen possible colors. This is, again, a situation where IBM has surrendered the guarantee of complete compatibility by not manufacturing the product itself." The article goes on to say that if you want a color monitor, you will have to buy an expensive (third-party) RGB monitor (some of these costing over $1000 at the time!) or use (again, from a third-party) a RF modulator device to connect the computer to a color TV. As I stated before, the 5153 (CGA) monitor was not introduced until about March 1983, about the same time they introduced the 5160. 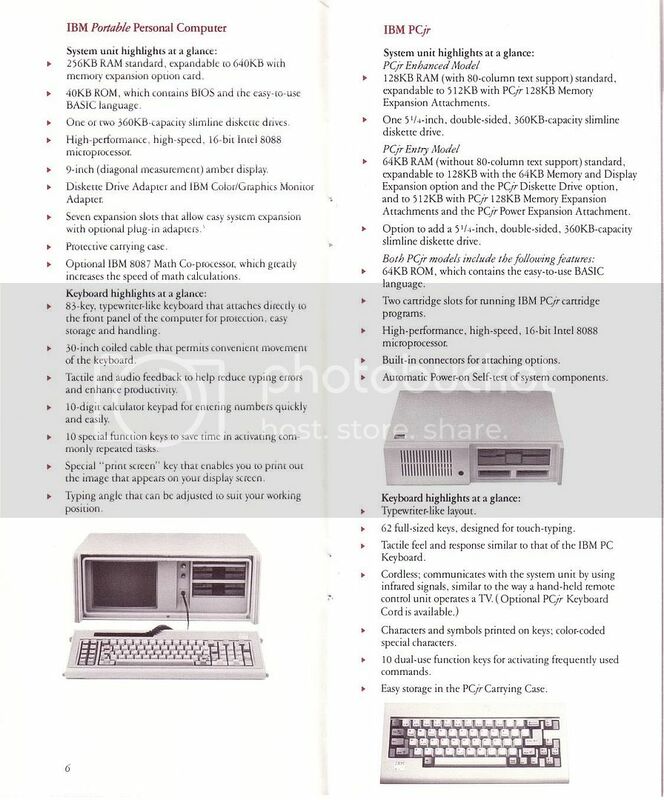 IBM also marketed the PC as an open design, with developers welcomed to make it more popular (and with the thought that someone needing to run a particular third-party adapter at least got the base system from IBM) among the competition. When IBM noticed that no one made a PC color display subsystem (looking back almost every PC video system standard originated from IBM) for the motherboard switches & video memory area they had defined, they did it themselves is the theory. 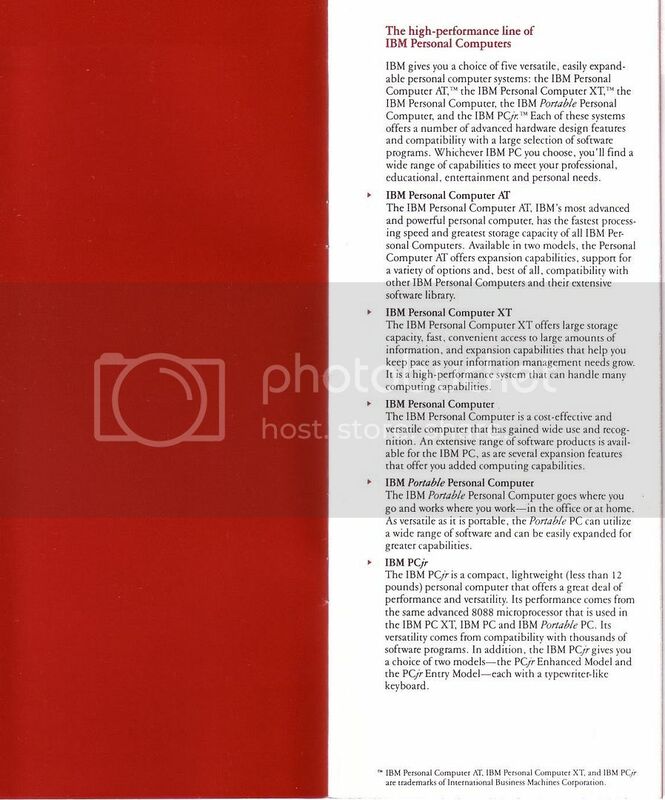 But when they saw competitors making the full base systems a licencing process came into place later for the PS/2s. I was reading through here and noticed that in the 01/10/86 BIOS of the IBM PC/XT it is listed there is 1.2MB floppy disk support. Is this true? I didn't think any of the XTs except for the 5162 supported 1.2MB drives. Why does it say "full support" for 720kb, and just "support" for 1.2MB? Yes, there certainly were. I have both type 1 and type 2 variety AT motherboards in green...two shades of green infact. I think that the brown type 1s are less common than the green ones, as I've only ever seen one in person. Though, the type 2s seem to be about evenly produced in both colours. Now what I've never seen is a green 640kb XT motherboard. I'm pretty sure they exist though. I personally like the green PCBs better, because they look pretty. I guess I'm just being racist. As the author of that post, I'll answer the question. The information in the post came from many sources. When discussing the second 5160 BIOS, one source indicated, "Full support for 720K floppy drives", with no reference to 1.2MB drives. I can't relocate that source. I don't know why the author used "Full". As for 1.2MB drives, Mueller's 'Upgrading and repairing PC's - First Edition' has a paragraph that discusses differences when comparing the second and third versions of the 5160 BIOS to the first version. In part: "Much of the new ROM deals with a greatly revised and enhanced POST, as well as interfacing to the new Enhanced Keyboard. I also see support in the new ROM for things such as the AT 1.2M drive and the 3 1/2-inch 720K drives in the PS/2 systems." 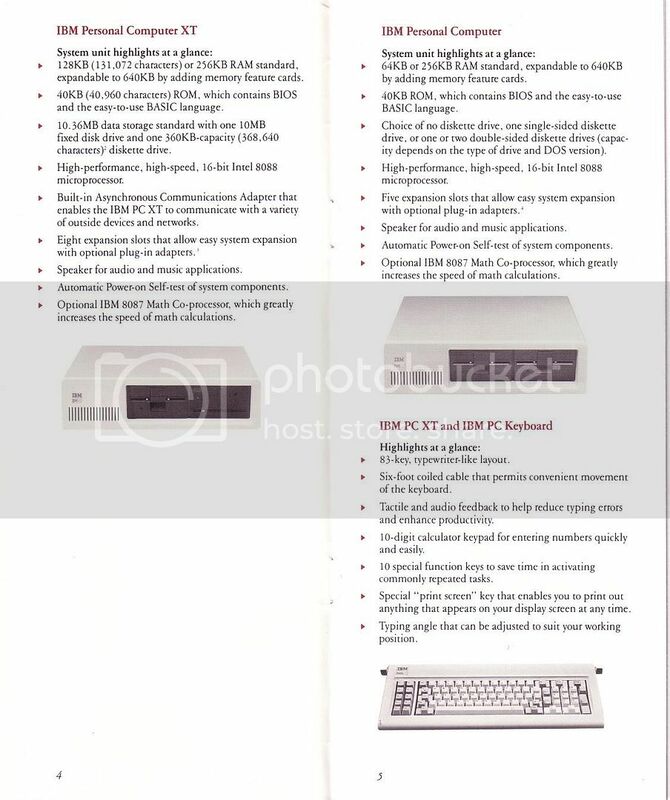 My IBM Technical Reference for the XT has the BIOS listing for the first and second BIOS. In the first BIOS (11/8/82), the source listing for the interrupt 13 (diskette) section contains, "this interface provides access to the 5 1/4 diskette drives". The track number range (passed in CH) is shown as "0-39". Thus, that BIOS supports 320KB and 360KB drives. In the second BIOS (1/10/86), the source listing for the interrupt 13 section contains tables showing the drive types/media of "320K", "360K", "1.2M" and "720K". That, no doubt, is what Mueller saw and commented on. And so 1.2MB drives are supported in the second and third BIOS. Is that "full" support? I don't know. Probably though. Note that whilst the BIOS (i.e. software) supported 1.2MB drives, there is the issue of hardware. The IBM diskette adaptor provided in the XT supported double density only, thus ruling out 1.2MB drives (until you put in a third party solution). I am looking for a complete list of the motherboard part numbers for the IBM XT, XT 286, and AT. Can someone post a link or the info itself? But when they saw competitors making the full base systems a licencing process came into place later for the PS/2s. Not the case. This myth that non-IBM Personal Computers were free of IBM royalties until Micro Channel came along is just that - a myth. IBM charged royalties on the early PCs as well. At the time the royalties system was highly confidential. So much so that here, in the UK, some manufacturers were quite surprised to be asked to pay. How do I know? I was there. I even remember the names of the guy in EMEA and the one in Boca who were responsible for collecting royalty payments.